Practical, comfortable ibis rooms are perfect for work or relaxation, and offer everything you need to feel at home: bedding and duvet, large desk, Internet, TV with all the main channels and a pleasant bathroom with a shower. 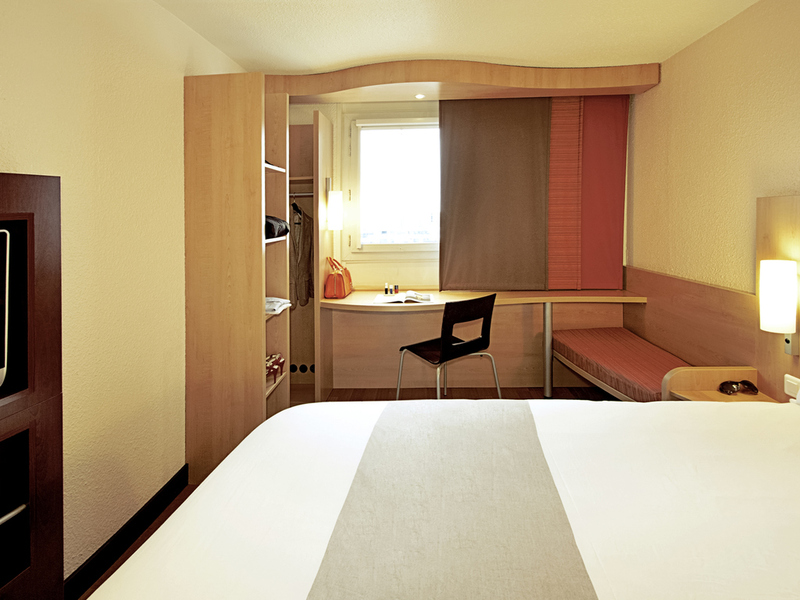 The whole team welcomes you to the ibis de Maubeuge hotel. At Bar Rendez-Vous, whether it's your first coffee of the day or final drink of the night, whether you're there for a break or for work, we offer sweet and savory snacks to suit all food lovers. Contrary to usual, I was disappointed this time. I was disappointed with my breakfast, the level of cleanliness in general and especially the utensils, the glasses had a bad smell. No hot water to take a shower every morning. Even after 2 days of maintenance to fix the problem there was still no hot water in the morning. I stayed in this hotel the week later and still there was no hot water in the morning. Modern hotel, very clean and confiotable with free parking just at the back. The staff were very welcoming and most helpfut. The brasserie a few yards away had a great atmosphere and offered local specialities, The hotel was very quiet and we had a good night sleep. Would go there again and recommend it. My coworkers and I recently had an extended stay at your facility, for business. At first communication was a bit difficult, your staff went out of he way to ensure all our needs were met. I'd like to thank Sophie for taking extra time with us, we greatly appreciate the extra time given us during the busy Christmas season. Thanks to your entire staff. Nicely welcomed, very good staff, friendly and helpful. Room clean and comfortable. Staff helpful and accommodated my bicycle. Very Good. Breakfast is good. But only thing it is repetative. Think of some changes. Overall wonderful experience. Would have been ok except for been woke up at 7.45 by a loud petrol grass strimmer outside our window. On our 2nd morning. Very nice. We had a very friendly welcome, no problem with the check-in, the room was spacious, clean and at a very good temperature. We had friendly help finding a nearby restaurant. A convenient place to stay in Maubeuge. The staff are friendly and helpful. The beds comfortable. The bathrooms are a bit small and awkward. The shower hose had a hole in it and was squirting water. Quite a lot of noise from the street because it is a bus terminus. Restaurants close by. A reliable hotel. Convenient for the business I was doing. The staff are always friendly and charming.